After a quick ride from your Las Vegas hotel in one of our custom Pink Adventure Tour Trekker vehicles, you’ll be ready to explore Red Rock Canyon. Encompassing about 197,000 acres, the area features a wide range of ecosystems, wildlife and multicolored views. The stunning landscape has served as the backdrop for dozens of films and your guide will share more insight into the park’s place in film history. First stop, the Visitor’s Center. Here, you may encounter charming desert tortoises in a protected habitat. You might even meet Mojave Max, the official mascot of the Mojave Desert. Browse more informative exhibits and shop for keepsakes. Part of the Keystone Thrust, the Wilson Cliffs are 3,000 feet high and are a popular hiking and climbing destination. Thousands of years ago, Wilson Cliffs’ towering walls were the perfect canvas for tribal artwork. Your Certified Interpretive Guide will explain the meaning and history of these ancient pictographs. Home to an impressive array of plants and wildlife, The Spring Mountains’ rich biodiversity thrives thanks to nearby springs that give the mountains their name. Don’t forget to ask your guide about the ponderosa pines and hundreds of plant species that flourish here. Awaiting you near the end of your tour, the Calico Hills are truly a grand finale. These rock formations are ancient sand dunes with fossils of animals and plants preserved within their layers. Water is stored in natural tanks, which feed the area’s unique ecosystem. Depending on the time of day, you’ll see why these hills are named “Calico;” a kaleidoscope of pinks, reds and oranges shift with the changing light. Before ending your incredible day, take the paved trail up to Red Rock Overlook. You’ll see all the landmarks from your tour at once and leave with incredible photos and memories of your beautiful Southwest adventure. Don’t forget to ask your expert guide any lingering questions on the ride back to your hotel. 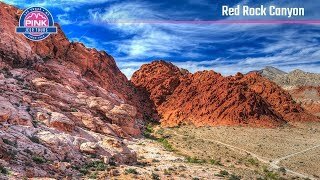 For a thrilling off-road ride through Red Rock Canyon, check out our Red Rock Canyon Rocky Gap Adventure Tour. The tour was amazing! Bill was very informative, had a ton of knowledge about the area, was very personable, and had a great sense of humor. He really made this trip worthwhile and unforgettable. I know this review is long overdue, but my boyfriend and I were just talking about this tour this morning and then I opened a drawer and out pops Bill's card! Thank you Bill !!!!! Exactly as described - fabulous! The tour guide was so fabulous, sweet and informative, so much so that we can't wait until we come back this September and hopefully book another tour or two.